A big part of medical education is mentoring. The term mentor originates from Homer's the Odyssey and refers to an advisor. The role of mentors vary, but generally serve to guide mentees through work, support them during the process, keep them grounded and focused on the task at hand, and provide general moral support. Over the weekend, at the Pritzker Revisit session on Scholarship and Discovery, our own students stated the number one thing to consider when finding a project was finding a great mentor. How does one find a great mentor? Well, our students are encouraged to seek "CAPE" mentors; think superhero mentors. The mentor should be Capable, Available, have a Project that is of interest to the student, and Easy to get along with. Capable means that the mentor has the skills to not only be a good mentor, but also to carry out the task or project at hand. This may sound like odd, but sometimes faculty are so excited to have a medical student work for them, they may make the false assumption that the medical student will help them with tasks (i.e. statistics) that they themselves don't know. Availability is especially important as it is the number one reason our students state they had a less than optimal experience in the summer doing scholarly work is that their mentor was not available. While availability of all doctors is an issue, the question is often whether faculty make themselves available when they can (i.e. answer student email, take phone calls, meetings). Setting expectations for when and how to meet can be very important. Ideally, the mentor has a project that is interesting to the student since if the work is not interesting, it will be even harder to make progress. Last but not least, the mentor has to be easy to get along with, meaning that their style meshes well with their mentees. Some people simply do not work well together do to different personality types. So, I often tell our students to consider that when meeting potential mentors or deciding between two mentors. As I was thinking about ways to highlight effective mentors, I recalled some classic movies with mentoring relationship. In relooking at these scenes this weekend, it struck me that there are some interesting reasons why they are good mentors that correlate with our model. Some of them are a stretch but they are still fun to watch! Yoda in Empire Strike Back encourages Luke Skywalker to not just try, but do. When Luke fails to resurrect the wing fighter, he does not allow Luke to make excuses but instead demonstrates that he can do it, showing that he is CAPABLE. Mr. Miyagi with the Karate Kid mentors through teaching small movements related to everyday house chores, "wax on, wax off." While he is certainly gruff and challenges Daniel, Mr. Miyagi also makes himself AVAILABLE to Daniel at that moment and in the future by saying at the end "Come back tomorrow" to continue the training. Remus Lupin goes so far to use a simulated Death Eater to challenge Harry Potter to learn the patronus charm (and making all standardized patient experiences seem like a cake walk). When Harry fails at first, he is patient and nurturing, stating that he did not expect Harry to get it on the first try. He also makes suggestions to the technique which turn out to be the key. Since Harry really needs this charm, this is a PROJECT THAT IS OF INTEREST and Harry ultimately succeeds in casting the spell. Gandalf in Lord of the Rings provides consolation to Frodo during a moment of despair by highlighting that it his job and also showing that Gandalf is sensitive to Frodo's needs and EASY TO GET ALONG WITH. In addition to these highly acclaimed superhero and superstar CAPE mentors, let me know if you know of other model mentors from the movies. Vineet Arora, MD, is a Fellow of the American College of Physicians. She is Associate Program Director for the Internal Medicine Residency and Assistant Dean of Scholarship & Discovery at the Pritzker School of Medicine for the University of Chicago. Her education and research focus is on resident duty hours, patient handoffs, medical professionalism, and quality of hospital care. 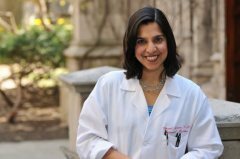 She is also an academic hospitalist, supervising internal medicine residents and students caring for general medicine patients, and serves as a career advisor and mentor for several medical students and residents, and directs the NIH-sponsored Training Early Achievers for Careers in Health (TEACH) Research program, which prepares and inspires talented diverse Chicago high school students to enter medical research careers. This post originally appeared on her blog, FutureDocs.